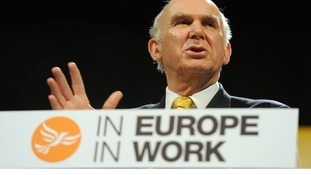 Vince Cable has hit out at Conservative immigration policy at the Liberal Democrats spring conference as a row rumbles on over politicians' use of migrant workers. Deputy Prime Minister Nick Clegg has accused Labour of not standing up against xenophobia and Conservatives of not standing up for business over the issue of immigration. "It is truly dispiriting to see the Conservative and Labour parties driven - as far as I can see - entirely by panic on this issue," he said at the Liberal Democrat spring conference. He appeared to describe Tory minister James Brokenshire's immigration speech as "irresponsible" and said Labour, in response, "won't stand up against xenophobia". Mr Clegg used the same speech to accuse the Conservatives of "no longer standing up for business." Vince Cable has stepped up his row with the Tories over immigration, accusing his coalition colleagues of tending to "fan the flames of prejudice" over the issue. Ministers have come under pressure to disclose their own use of foreign domestic help after Immigration Minister James Brokenshire deplored the effects of the "metropolitan elite" using cheap migrant workers. Mr Cable called for changes to make it easier for foreign students to stay and work in the UK, and for immigrants to bring their families to live with them. Liberal Democrat Chief Secretary to the Treasury Danny Alexander today also hit back at Mr Brokenshire's comments, which he described as "incredibly dangerous". Mr Alexander defended his own employment of a Portuguese cleaner, while David Cameron was also forced to answer questions over his family's hiring of a Nepalese nanny. Whenthe new immigration minister James Brokenshire attacked what he called the "wealthy, metropolitan elite" for benefiting from cheap foreign labour, it's unlikely he meant to point the finger at the Prime Minister. But his words have now come back to haunt the government, after it emerged the Camerons had hired a Nepalese woman as a nanny who later gained British citizenship. Tonight, Number 10 were forced to clarify her immigration status after questions from Labour and journalists. She had put Samantha Cameron down as her employer but there was no special pleading on her behalf. Do these domestic arrangements really matter politically? Well, it shows what a sensitive subject immigration continues to be - and why getting the tone right can be tricky. Downing Street has insisted David Cameron followed all the "proper processes" after it emerged his family's Nepalese nanny has been granted British citizenship. Questions were raised about Mr Cameron's use of foreign domestic help after a minister deplored the effects of the "metropolitan elite" using cheap migrant workers. Home Office minister James Brokenshire said yesterday the wealthy had been the main winners from Britain's openness to labour from abroad, because they had to pay less for tradesmen and services. The Conservatives' new immigration minister James Brokenshire had earlier said that Mr Cable was "incorrect" over the seriousness of the figures and also stated that wealthy Britons are "benefiting from immigration"
The Liberal Democrat Business Secretary Vince Cable has told ITV News that the issues over immigration are of "genuine concern to lots of people" and that he won't get into a "party political barney" with opponents or Coalition partners. The Conservatives' new immigration minister James Brokenshire had earlier said that Mr Cable was "incorrect" over the seriousness of the figures and also stated that wealthy Britons are "benefiting from immigration". Immigration Minister James Brokenshire's speech today on border control was "feeble and pathetic", according to the head of an influential business group. The Director General of the Institute of Directors, Simon Walker, said Brokenshire's speech seemed to be "more about political positioning and less about what is good for the country". The Conservative party's new immigration minister James Brokenshire is expected to accuse the middle classes of befitting from the arrival of foreign workers into the UK in a speech today. "For too long, the benefits of immigration went to employers who wanted an easy supply of cheap labour, or to the wealthy metropolitan elite who wanted cheap tradesmen and services – but not to the ordinary, hard-working people of this country," Mr Brokenshire is set to say. "We are changing that and building a system that benefits all." Last week, migration experts and rival politicians accused the Government of losing its grip on immigration policy as official figures revealed the net flow of migrants into the UK surged year-on-year by more than a third to 212,000 in the 12 months to September 2013. In his inaugural speech as Immigration Minister, Conservative James Brokenshire is expected to say, "In the past year net migration from the EU has doubled and this figure is, frankly, just too high. "Some have tried to claim that this rapid increase is somehow 'good' for the country. Well, just like the Home Secretary, I disagree." This will be in contrast to Vince Cable's Mansion House speech this evening where he is due to say the UK economy will be held back if the country is seen as "closed for business". Business Secretary Vince Cable is expected to say he is "intensely relaxed" about people coming to study and work in the UK "provided that they pay their taxes and pay their way". Former Labour minister Lord Mandelson once famously said he was "intensely relaxed about people getting filthy rich as long as they paid their taxes". During a speech at Mansion House tonight, Mr Cable will say, "I start from a fairly simple, basic economic proposition embedded in the EU Single Market: free trade - that is, the free movement of goods, services and labour - is good. "This is particularly true about the free movement of people bringing skills in demand."